We had a wonderful and relaxing long weekend at The Paddock in Tunstall. The location is excellent and we were blown away by the standard of food in the village pub. The cottage is warm, comfortable and immaculately clean. The underfloor heating was a real bonus as we arrived during a heavy storm. Great to have 2 bedrooms and 2 bathrooms so that everyone could enjoy their own space. Paddock Cottage is a lovely cottage, well equipped, warm and cosy. It is peaceful and in an excellent location. Julie and Stephen (and their managers) are warm and welcoming and I am sure we will return. My husband, myself and our Cocker Spaniel had a fabulous 6 nights in The Paddock. We have been having cottage holidays for many years and we thought The Paddock was one of only a handful of cottages we would want to go back to. We were lucky in that the weather was very good whilst we were there. It was a pleasure to go back to each day after sightseeing in the area. We spent many hours sitting out in the garden and saw many different birds and visiting squirrel. The pub in the village the Lunesdale Arms was the best pub for food and friendliness. The food there was excellent and the staff there very friendly and helpful, after eating out at many pubs and restaurants in the area we found the pub in the village to be the best. We had our dog with us and most of the pubs in this area welcome the dogs. The only reason for not giving full marks is we found the kitchen to be missing a few items. A bread bin would have been useful and containers for cakes and biscuits, a couple of more cups etc. All in all this did not put us off this lovely cottage in a perfect spot, we hope to go back in near future. Also, the customer service at Millhouse Cottages was excellent. Booking easy and Julie was very helpful when we booked. The Paddocks is located in a beautiful, but overlooked, part of the country - sitting between the Lake District and Yorkshire Dales. The property is very comfortable but needs some maintenance outside - it is showing signs of wear. Internally it is very well presented and comfortable. There is a great pub in the village and all in all it makes a great place for a short break. This is a lovely cottage, small but exactly what we needed for two of us and two dogs. The outside is in need of a tidy up - eg painting windows etc and the garden much in need of some weeding but this didn't particularly detract (the gardener did come when we were there but only to cut the grass (very small lawn). Inside was very clean and had everything we wanted. The garden is enclosed and private. It's in a great area for visiting Cumbria, the Dales and the Forest of Bowland. The pub in the village, the Lunesdale, and the one you can walk to across fields, the Highwayman, were both very good. The cottage was very warm but we did stay when the weather was fantastic, it would be very cosy in winter with the fire lit. We couldn't figure out how to turn off the heated towel rail in the upstairs bathroom and the weather was so warm we ended up having the window wide open beside the towel rail throwing out heat which is a bit mad. Otherwise lovely stay and we'd definitely return. Had a great week back in the North near where I grew up. This cottage is in a fantastic location been convenient for my three favourite counties- Lancashire, Yorkshire and Cumbria. The cottage was clean and comfortable and felt spacious for myself, my husband and our two children. We thoroughly enjoyed our stay. Although the cottage is very well equipped for catering if you do fancy a night off we can definitely recommend the Lunesdale Arms. Great place, My husband loved the wood burner in the cosy sitting room. The kitchen was excellent. It was a shame the upstairs shower didn’t work and a shelf in the shower downstairs would have been useful. Welcome pack a nice touch. Has all the modern necessities needed to completely relax in comfort . We will definitely be returning here !! This is the 2nd time we've used Mill House, which we've never done before! It's great to deal with Julie, really informative and the booking process is easy. The Paddock is beautiful, clean, modern and rustic at the same time, comfortable, great location. The kitchen is the hub of the house, really well equipped. We took our dog, and it was great to have almost an annexe with the second bedroom/bathroom downstairs, all linking through to the kitchen and lounge. Upstairs was beautiful, a huge bedroom and bathroom. The garden was great, behind closed gates with lovely gardens/patios etc. For us the cottage was ideal, just a few little observations that would further enhance it. The information pack needs an overhaul, certain elements we believe relate to another cottage! for example we had a problem with the induction hob in that it would switch on but none of the hotplates would function. The instructions referred to the consumer unit under the stairs and the circuit breaker needing to be switched off and back on to correct this (no under stairs cupboards). We eventually found an isolator switch in one of the island cupboards which corrected this. The visitor information leaflets are all out of date, viz the Settle to Carlisle railway, Windermere cruises etc. all time tables were for 2015 or there about. The pub in the village is shut until September and personally we do not think the "Highwayman" is walkable on a bendy main road with no footpath. A bit of a moan but overall the cottage is great and we had a lovely holiday and we would use the Paddock again. Though the house was clean things like not enough toilet paper and no key fob had not been left The house it self needs some attention the shower up stairs leak so eventually over the day a pool appears on the bathroom floor. I certainly would not recommend the stairs if you have any sort of disability because they do have an awful turn in them and rather steep. The fridge and freezer both need a a good defrosting because at present they don't work properly.The bed upstairs is very soft and could do with a topper on it. The garden is rather neglected and down the side of the house can only be described as a mess. The drain pipe which goes down the side of the sitting room is leaking so when it rains the noise from it interferes with your listening of the television.We original had been intending to take the dog as this was the only house that we had been offered when we booked We are glad we did not because it's not really suitable because it's difficult to find some where local to let him off the lead.While in the Lakes we found another house that will take dogs with the company.I know this all sounds very trivial but the attention to detail makes all the difference. We personally would not use this house again but it's not to say we would not use the company again. Many thanks for taking the time to review your stay. I am sorry that you felt that the property did not meet your expectations. We take all feedback very seriously and will certainly investigate some of the comments you make. I do need to point out however that the property does not back onto the main road and is in a quiet courtyard location. Also, the stairs are not at all steep. The side of the house is used for bin and re-cycling storage and is well screened from the garden. If you had gone up the lane (50 paces), there are lots of open spaces/footpaths and fields but of course, this is a farming area and dogs do need to be under control. We had a most enjoyable stay at The Paddock. The cottage is very well equipped and tastefully furnished. It was a joy to be welcomed by the bottle of wine and immediate necessities. The problem with the gate was dealt with speedily by Steve and we felt looked after. The Paddock is quiet and comfortable, yet conveniently located. We discovered the Bronte connection with Tunstall Church, which was a bonus. We shall definitely use Millhouse Cottages again. The Paddock is a lovely cottage in a quiet and secure location. My husband enjoyed cooking in the kitchen which is a well equipped and well thought out, ideal for entertaining. The upstairs bathroom and bedroom are a very nice space with large bath and wet room area. I have to agree with other reviews on the site that the settee in the lounge is very low for older people, as we found it a challenge and don't consider ourselves old. On saying that we would certainly return and use the Paddock again. We really enjoyed our stay and would go to the Paddock again. Spacious master bedroom with comfortable bed and very good adjacent bathroom. Kitchen fine and useful utility room for dog owners. Ground floor shower room a little past its best. The lawned area in the garden is quite small for a large dog but is fully enclosed. It's a quiet area, but you do get traffic noise with the bedroom window open, especially from the motorbikes going to and from Kirkby Lonsdale. The Lunesdale Arms is very close but was closed for refurbishment while we we there (May 2017). The Highwayman pub, a mile away, does great food - we drove as it's a busy road with no pavements, although there may be a way across the fields. An easy drive to lots of lovely villages and small market towns. Stunning scenery and great walking all around. Excellent property in an excellent location. Very happy with our stay and the level of customer service provided through Mill House - would happily book with them again on our next visit to the area. One of the best cottages/companies we have stayed with in the UK. Good size for 2 people with dogs. Excellent customer service. Property was clean, kitchen well stocked re cookware, tableware, glassware, cleaning products & tea/coffee, which is rare! Location was peaceful & the cottage ideally located for dog walking & sightseeing. Easy access to the M6 too for travelling. We will definately be returning & have already booked to stay at Mill House's Skye Fall Cottage in Scotland. Our third stay and second Christmas at Mill House Cottages. These cottages provide a great base for winter stays - cosy, clean and luxurious in a thoughtful and practical way. The beds are particularly good and we sleep well. A great spot for beautiful walks and good eating places. The tasting menu at Hipping Hall was excellent value for money for our anniversary. Cottages are well equipped for cooking too. This area will be even better when the M6 is clear of roadworks. We had a wonderful time at The Paddock. The house is beautiful and in a great location for exploring both the Lakes and The Dales. Would not hesitate to recommend. We were really happy with the cottage, it was very warm and comfortable (the underfloor heating in the kitchen area was brilliant), and the welcome hamper including milk, butter, bread, jam and a bottle of wine was a really lovely touch. The enclosed garden was great for my two dogs to run around securely, and all the neighbours that I met during my morning walks were friendly and welcoming. The pub was undergoing a change of management & refurb while we were there, which was a shame, but there's plenty of places to eat and drink within a few minutes drive from the cottage. The cottage is in a good location for both the Yorkshire Dales & the South Lakes, with lots around within a 40 min drive or less, and I would highly recommend a stay here. Good location and spacious house with a fabulous big bath! Kitchen could have been better equipped and with kitchen knives that actually cut! But overall a very nice place to stay with lots to do and great walks on the doorstep. Stayed here while building work was carried out on our own home. Found The Paddock extremley comfortable with just about everything we needed for a months stay. If you were using The Paddock as a holiday retreat then I think you would be very pleased with the accommodation and peaceful location. Close to The Hideaway Pub for meals, Kirkby Lonsdale for small market town. Plenty of places to visit in this beautiful area, Lake District, National Trust properties and the Furness peninsular. Definitely can recommend this property. It used to be a really nice house! My wife and I stayed at this property less than 3 years ago and found it pleasant, well equipped and well maintained. Sadly, this is no longer the case. Parts of it are now looking distinctly tatty and in need of refurbishment, the standard of cleanliness was very poor and, overall, it was very disappointing.
. Cheap pieces of foam used as "mattress toppers"
Having enjoyed our previous stay, we felt pretty let down when we found the condition and cleanliness of this property had deteriorated so much. In its current condition, we do not consider that it merits a 5 star rating, and we would not use it again. The cottage was well equipped and it was good to have 2 bathrooms. However the dining room chairs were very uncomfortable (old?) and the twin mattresses were not supportive. There were a number of light bulbs not working. The living room could have done with more cushions. Overall we felt the cottage was over-priced. The very effective website suggested that the cottage was more in the country than was the case, and therefore an outside shot of the cottage and its situation would have been a more helpful and representative description of location and probably would have meant we went elsewhere. Thank you very much for taking the time to review your short stay at The Paddock. We are very upset to note that you did not enjoy The Paddock as much as everyone else who has stayed. All the furniture is very new and of a 5 Star standard and we very clearly state that the property is in a village location. We would never misrepresent any of our properties but we will certainly take a look at how The Paddock is described on line and make any necessary adjustments in view of your comments. The Paddock was all we could have asked for and more. Everything that was required to have a great break was there. Loved our stay and would have no qualms in going back. The Paddock is a fabulous cottage with upstairs and downstairs bedrooms and facilities giving each couple their own space. The central kitchen, dining and lounge was just perfect for when we got together and the gated paddock gives the sense of being in your own world. Overall a great cottage and ideally placed to explore the Dales. We had a wonderfully comfortable stay at The Paddock and will return without hesitation. Everything was top-rate and a problem with the smoke alarm was sorted within minutes of us phoning Mill House Cottages - excellent service. Our kids especially loved the tennis court in the village. We loved the area, Kirkby Lonsdale was a treat - cannot wait to return. We absolutely loved the Paddock. The rooms were all perfect in every way especially the open-plan kitchen/diner and glass front to garden/courtyard. We hope to make another trip back! Wonderful cottage - very clean, comfortable, modern & well equipped. Well decorated and laid out. Excellent service provided by owners. Good location in quiet village with private, secluded garden. Good quality appliances. Everything was to a very high standard and it met my expectations. Would happily recommend this accommodation to others and would book again if I return to this area. A few minor quibbles, in approximate order of importance, but nothing that would stop me from returning. - towel rail & underfloor heating in the utility room made the ground floor bedroom very warm & there didn't seem any way to control this. If the weather had been warmer, this would have made sleeping in that room very unpleasant. - low sofa was a bit difficult to get up from for an old fella like me! Thoroughly enjoyable stay at The Paddock. It was clean comfortable and most things were provided. The owners visited to check that all was OK the morning after our arrival and were always available if we needed help with anything. The internet connection was intermittent which was inconvenient at times. This is our second visit to Paddocks and it gets better. It is so cosy, warm and inviting. The attention to detail including all the cosmetics, etc., provided. It is in such a private and quiet location. You can visit three counties in a mater of a few miles. Just wonderful. We shall be returning and recommending. The BBQ was particularly great to use. Thanks to Stephen, Julie and all her team. We absolutely loved it, it felt so homely, welcoming and peaceful, we didn't want to leave and I guarantee we will be back, exquisite property, thanks for having us. Perfect cottage... Central location... Very warm and cosy with towels and bed linen provided. I could not fault anything. A minor point would be.. Lack of serving bowls for vegetables etc... No gravy boat, measuring jug and steamer to go inside pans for vegetables.. This however would not deter us from a return visit as I would simply bring those items with me. An extremely well appointed comfortable home from home in an excellent location. The property is as described and is spacious yet homely. Would return. Great cottage in a lovely location, peaceful and out of the way. Close to the lake district and to Kirkby Longsdale (good cafe's and quaint shops). Both bedrooms had own bathroom so privacy was great. The garden is fully enclosed so my terriers couldn't escape. The 2 local pubs allowed dogs in so we could have a meal out. Property had a fantastic kitchen/diner with all the equipment we needed. Very large towels provided and plenty of other bits, like soap and dishwasher tablets. The welcome hamper had a variety of local produce, a nice touch. We would definitely go back. Very high standard, barn conversion ideally located between the South Lakes and the Yorkshire Dales. Walking distance to a pub serving food. Quiet but not off the beaten track. Gorgeous cottage in a perfect location. Lovely welcome hamper and cottage very clean and well equipped.We loved it and would come again. However we do have a few suggestions to make it even better. It would have been nice if there was a clothes line and pegs outside, and a clothes airer for inside. We couldn't get the toaster to work and there was no cheese grater. A few more mugs and bowls would be good and a shaver/electric toothbrush socket in one of the bathrooms. Just little niggles that would make it perfect. The cottage was stunning, so peaceful and fully equipped for everything we could have wanted for our stay. The facilities were all top notch and we even managed to sit in the sunshine outside one afternoon which made us long to come back in the summer. Tunstall itself was also lovely and we liked the fact that we were not in a town and yet only a few minutes drive from one. If I had 1 criticism it would be that there was no plug near a mirror in the bedroom to plug hair straighteners/ dryers etc into, so My wife ended up doing that in the utility room with a small mirror propped on the shelf. We did realise there was a hairdryer in the bathroom, but She likes to use her own. It would also have been nice to have some details/ maps of any local walks from the cottage as there were not any that we could find. A truly wonderful stay and we wished we had booked it for longer...loved it and hope to come back one day soon. The accommodation met all our requirements and needs and the owners responded to the one or two minor problems both quickly and efficiently. The cottage is superbly maintained and equipped. The only suggestion that we could make would be that it would be useful to have a few more mugs available as this would mean that the dishwasher could be used less or we would not have to wash up the mugs between meals. We would definitely return to this fantastic cottage. Wonderful location with plenty to do in the area. Well equipped with everything and spotlessly clean. We love The Paddock. It is in a great location, surrounded by wonderful countryside yet very close to Kirkby Lonsdale. Stephen and Julie are wonderful hosts who are always on hand and The Lunesdale Arms is a great place to eat . Once again we spent a very happy 10 days at The Paddock and were made very welcome by Stephen & Julie. We have had a wonderful week staying at the Paddock, a beautiful and most comfortable place to stay. Stephen and Julie have made us most welcome. A perfect area for discovering the lakes, exploring the Yorkshire Dales, and surrounding area.This is our second stay, and we would highly recommend any of the properties. A great property in a great location resulting in a really enjoyable holiday. Wonderful location to visit The Lake District and the Yorkshire Dales. Totally self-contained and not over-looked. All you would expect from a 5 star property. A very comfortable cottage with all the facilities that you require. The Lunsdale Arms was only a few minutes walk away and the food there was excellent. Our only problem with the cottage was that there was no instructions on how to use the kitchen equipment and in fact we did not attempt to use the built in microwave as fortunately there was an simple one in the utility room. We loved The Paddock it was a brilliant find and will definitely come back and stay there. We visited with my parents recently and, as my Dad has mobility issues, we wanted somewhere which we could all enjoy. The Paddock was perfect for us all, including Katie the Cairn! There is a downstairs bedroom with a walk in shower which was perfect for Mum & Dad and we had the upstairs suite which was more than perfect for us. All the decoration, crockery, accessories and furniture were of the highest quality including the bedding which is some places we have visited over the years gets forgotten - not here - there was lovely bedding on all the beds. Also we have never visited anywhere, apart from our own house, that uses Denby tableware - we were very impressed with everything. Steven & Julie made us feel very welcome and had left a small hamper for our arrival which was very well received - the wine we drank that very night! We are keeping an eye on the website for when The Pavilion will be free! In summary this is high quality accommodation in a wonderful area at the meeting point of 3 great counties. 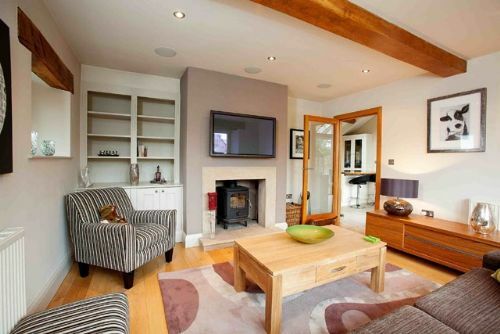 Lovely cottage in quiet village location, but only 3 miles from Kirkby Lonsdale. Nicely decorated, well equipped and very comfortable. Friendly pub with very good food only 2 minutes walk, with a variety of other good eating options within a short drive. We had a lovely time and we're pleased to find that the cottage matched up to the pictures on the website - which is not always the case. We would be happy to stay in this cottage again. First Class as always. We have stayed with Millhouse Cottages several times. Stephen & Julie always look after us. We are already looking forward to our next visit. My husband and I have recently stayed at the Paddock in Tunstall for the second consecutive Christmas! The Paddock is situated within the lovely village of Tunstall and within a three minute walk of the Lunesdale Arms which is a truly amazing pub serving an excellent selection of locally sourced food and locally brewed beers. Furthermore, The Paddock is within a five minute drive of the picturesque market town Kirkby Lonsdale which boasts a lovely Booths supermarket and several independent shops, restaurants and coffee shops. The Paddock is very well appointed cottage; the layout really succeeds in providing contemporary, comfortable and relaxing accommodation. This cottage is truly home from home! We cannot wait to return for our third visit.